The state medical examiner’s office is doing fewer autopsies. What does that mean for the public? 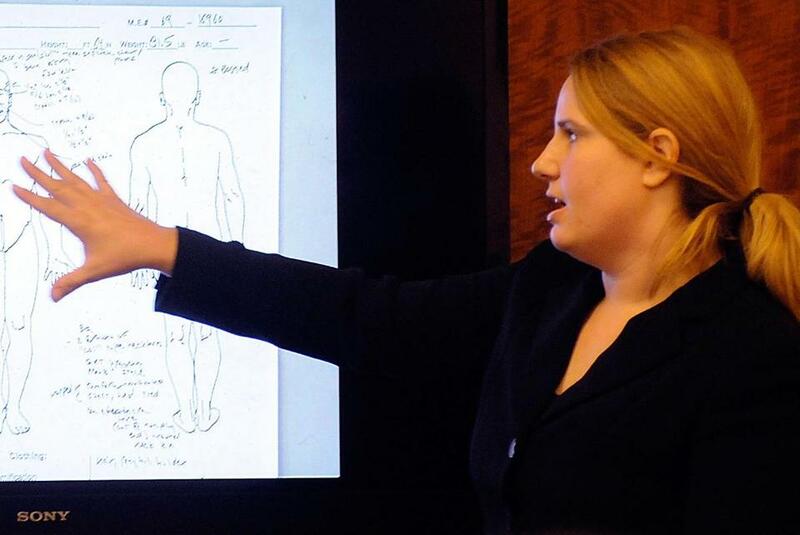 Medical examiner Dr. Mindy Hull testified during a murder trial in 2014. After years of trying, and failing, to turn out timely reports explaining how people died, the state’s chief medical examiner’s office had good news to report last month: Dr. Mindy J. Hull said her office is now completing more than 90 percent of its collective autopsy reports and death certificates within 90 days, meeting a long-elusive standard. “That actually hasn’t been that hard,” Hull, tapped to lead the office in October 2017, told a state commission. One difference, she said: She’s “taking a strong management eyeball” to it. Left unsaid, however, was another crucial factor: Under Hull, the office has routinely forgone autopsies in favor of less-rigorous testing to investigate deaths, including some of the hundreds of suspected fatal overdoses across the state. The decision can speed up the work in the face of a mounting caseload spurred by the opioid crisis. A physician can generally perform one autopsy in the time it takes to do three so-called external examinations. Those can include viewing the surface of the body, reviewing medical records, and doing minimally invasive testing, such as toxicology. But experts warn that carries an inherent risk of missing the cause of death, especially in suspected drug-related deaths. It also runs counter to standards set by the National Association of Medical Examiners — or NAME, the same organization that recently accredited the Massachusetts office — which recommends an autopsy be performed whenever “intoxication” is the suspected cause of death. The underlying shift has been a little-discussed development as the office has cited gains under Hull. In August, it announced it had secured the full accreditationit had sought for years, an accomplishment hailed at the Nov. 15 meeting of the state Commission on Medicolegal Investigation. Board members, who oversee the Office of the Chief Medical Examiner, gave Hull a round of applause. Under Hull’s predecessor, most people under 50 who were presumed to have died from a drug overdose were autopsied, state officials said. It helped ensure that in fiscal years 2016 and 2017, autopsies made up a slim majority of the office’s caseload — even as turnaround times lagged woefully behind. In the first six months of 2018 under Hull, however, autopsies accounted for just 38 percent of the more than 3,100 cases the office handled, according to the office’s internal estimates. The rest, about 1,950 cases, were external exams. The office is using “instant urine screening tests” to check for the presence of cocaine, opiates, and fentanyl in potential drug deaths, and while Hull may require a medical examiner to perform an autopsy in some cases, it’s up to the physicians under her to decide whether an external view and toxicology testing are enough. With fewer autopsies being performed, turnaround times have improved, according to agency data: In the first half of the year, 86 percent of autopsy reports were done within 90 days, compared to 58 percent in a two-year stretch predating Hull’s appointment. The office is now producing 97 percent of death certificates from external examinations within the 90-day window. “Performing autopsies on cases where cause and manner of death are apparent on external examination diverts attention from cases that may be much more difficult to resolve,” said Felix Browne, an agency spokesman. But it’s a pattern the oft-embattled office’s former leader directly cautioned against as recently as 2015. Then-chief medical examiner Henry M. Nields warned that the approach posed a series of risks, including “undetected” manners of death, and that best practice called for autopsies in 80 percent of cases. In his final three full fiscal years in the post — 2015 (46 percent), 2016 (51 percent), and 2017 (54 percent) — the office fell short of that number. Toxicology tests by themselves aren’t always decisive, and without a full internal autopsy, a medical examiner may not be able to exclude other superceding causes of death, said Arden, the NAME leader. Compounding the problem, Arden said: Amid the opioid epidemic’s rising death toll, many offices may be turning to external exams simply to keep up. In Massachusetts, the tides of the crisis remain stubbornly high. In the first half of 2018, when Hull’s office turned repeatedly to external exams, there were more than 1,000 confirmed and estimated opioid-related overdose deaths. The movement toward doing fewer autopsies isn’t uniform, either. Smaller medical examiners offices in Connecticut, which handled 2,722 cases in 2017, and Rhode Island, which handled 1,002 in 2016, reported relying on autopsies 86 percent and 70 percent of the time, respectively. In Washington, D.C., the medical examiner’s office performed an autopsy in 70 percent of its nearly 1,300 cases in 2016. Conversely, in Virginia, autopsies accounted for 35 percent of the medical examiner’s 6,900 cases two years ago, closely mirroring the approach in Massachusetts under Hull. In New Hampshire, which has been similarly ravaged by the opioid crisis, the medical examiner’s office said it performs autopsies in about one-third of its cases. The Massachusetts office has long been marked by turmoil, from efforts to cut a backlog of years-old paperwork to struggling to hire new pathologists. It began the current fiscal year with 88 employees, and officials said they were in the process of making 12 hires. The office is recruiting to fill seven other spots, Browne said. It also faced renewed scrutiny in the spring, when Hull’s hand-picked chief of staff, Lisa Riccobene, was suspended and demoted amid revelations she had misrepresented her credentials. Weeks later, agency officials said that Riccobene, despite losing her title and $112,000 salary, would have many of the same duties after being demoted to a newly created $90,000 non-supervisory job. In her new position, Riccobene “coordinates” with three other supervisors, Browne said. at matt.stout@globe.com. Follow him on Twitter @mattpstout.